Second Lives for Shipping Containers – Student Housing | The Life and Times of a "Renaissance Ronin"
When I was in Israel, I met with several people about using ISBUs (Shipping Containers) to provide student housing. There was a LOT of interest. Here’s one project that is ready to go on-line in the Southern Israeli desert. It’s a good example of exactly what I was talking about. While this is the first village built entirely of shipping containers, it’s not the first ISBU structure in Israel. There are several. I know this for a fact, as I personally built several of them. Globally, the “student dorm/housing” market is ripe for this solution right now. In fact, we’re involved in “The Agridorm Project” to do exactly this in the US for a University in the Midwest as I type this, with several more interested schools currently in “negotiations”. 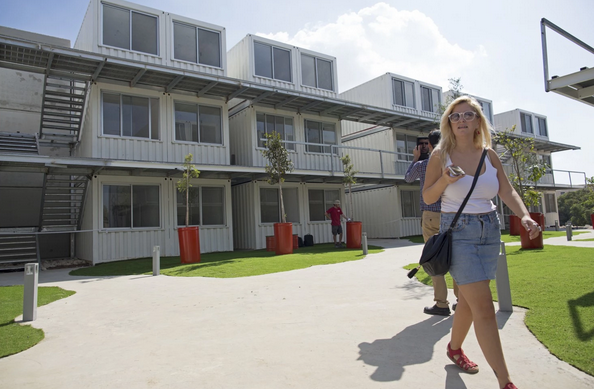 “In Israel, where hundreds of thousands of people led by a group of university students took to the streets in 2011 to protest the high cost of living, converted containers are being used as a solution to the dire shortage of affordable student housing. “There are millions of these containers that can be used. They are usually discarded after only two or three years and the companies don’t know what to do with them,” said Effy Rubin, director of partnership at the nonprofit student organization Ayalim, which encourages young people to move to the Galilee and Negev desert regions. Rubin said the containers were bought from Israeli companies for about $2,000 each and were transported this year to two locations in Israel — Sderot in the south and Lod in the center — to form the basis of the country’s first two container villages. Renovations to turn the containers into a livable space — two containers were fitted together for each apartment — cost a little more than $40,000 per apartment and took less than six months to complete. In Sderot, a city that sits in close range of rockets fired by Palestinian militants in the Gaza Strip, the container village includes interlocking stairwells with reinforced concrete to provide bomb shelters. This solution could be used to house seniors, create shelters or provide housing for seasonal/factory workers easily. IMHO – With so many in need of shelter, it’s time this solution was mainstreamed.